Standards: This activity is aligned with the district's science curriculum for grade 5 which explores the Earth and moon and their roles in our solar system. 5.3 Most objects in the solar system are in a regular and predictable motion. The position of the earth and moon relative to the sun explain cycles of day and night and the monthly moon phases. B 23. Describe the monthly changes in the appearance of the moon, based on the moon’s orbit around Earth. Observe and record the moon’s appearance over time. Analyze findings to describe the cyclical changes in its appearance from Earth (moon phases). Duration: This activity will require two class periods. Explain why the moon's appearance in the sky changes and correctly label it phases. Describe how planetary orbits are responsible for seasons, day/night, a moon phases. 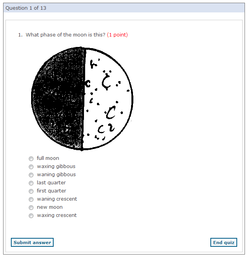 Students will take an online assessment to demonstrate their understanding of the lunar cycle. Materials: Each student will need access to an IOS mobile device, such as iPad, iPhone, or iPod Touch with Internet access. The six apps identified below will need to be downloaded onto these devices. Students will be asked to perform a seemingly simple request: Point to the moon. A common response from students is that the moon isn't out in the daytime and its impossible. Using their IOS device, the GoSkyWatch app lets students identify and locate stars, planets and constellations simply by pointing their mobile device to the sky. This activity is lots of fun as the students tilt, bend, and twist looking for the moon on the mobile screen. When the class finally figures out where the moon is, the teacher can begin to introduce the concept of planetary orbits. Students will watch a video on the NASA app called Supermoon, which explains the rare phenomenon when the moon is the largest in the sky. 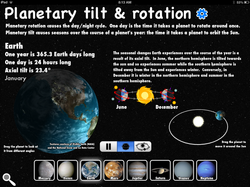 Students will use this app to explore planetary tilt and rotation to discover why we experience night/day, seasons, and the phases of the moon. 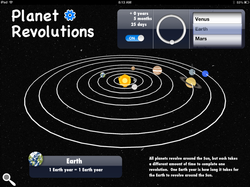 The app allows students to compare any two planet's tilt and rotation. At least two planets should be compared to Earth, and the students should be able to provide an explanation to the teacher as to how the length of day/night varies on the other planets. 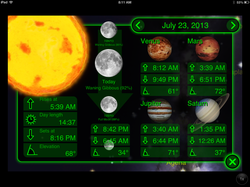 The app also provides an interactive representation of the planets' orbits. Students should explore this feature until they understand how the orbital paths of a planet affect their visibility for an observer on Earth. After studying the orbits, students should return to the GoSkywatch app and determine which planets can be seen in the night's sky. As a homework assignment, students should be asked to try and find the planet(s). Using the Star Walk app, students will us the Sky Live feature to learn how the rotation, and orbit of the moon around the earth, changes how the moon appears in the sky (phases of moon). The app allows the user to change the date, and students should be asked to go through at least a two month date range to see all phases of the moon. Students will watch a video on the NASA app called South up moon phase & libration 2013 This video shows the moon as it goes through all its phases for a full year. These are real video images, not illustrations, so students can see how the moon really looks. 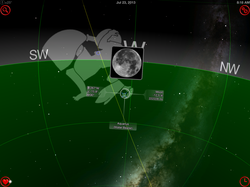 This app provides students with a view of the current moon phase, as well as a thumbnail slider of prior and future moon phases. 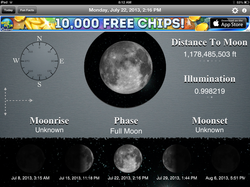 The date range can be adjusted so an entire lunar cycle can be viewed. Unlike the Star Walk app. this app does not label the moon phases, so students can use this as a formative assessment. The teacher should give each student five dates for which they must identify the moon phase. Let me show you what I know! This app lets students take a 13 question assessment on the moon, its phases, and tilt/rotation. Students need to correctly identify moon phases from illustrations and answer a handful of questions regarding facts about the moon. Students will have a choice between two closing activities to demonstrate their understanding of lunar phases. Students can use their iPhone/iPad to take a photo of the moon for one full lunar cycle (yes, 28 days). 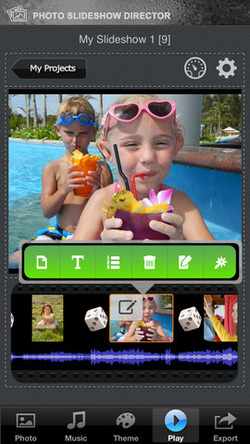 Then by using the Photo Slideshow app, the individual photos will be combined into a single slideshow. Each slide will be annotated with a text label to indicate the name of the moon phase. Slideshows will be presented to the class so everyone can observe what the moon looked like in their "own backyard" using a time lapse photography effect. 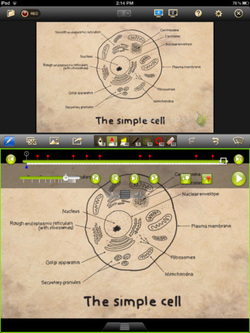 Image: sample screenshot of the drawing and playback control tools in Photo Slideshow Director. Students will use their own photos of the moon. Students will use the Doceri screencasting app to make a 28 slide presentation. On each slide, students will using the drawing tools in Doceri to draw the moon as it appears each day for one complete lunar cycle (one slide per day). Each slide will be labeled with name of the moon's phase. The presentations will be presented on the interactive whiteboard so the lunar phases appear like a hand-drawn movie. Image: sample screenshot of the drawing and playback control tools in Doceri. Students will create their own illustrations of the moon. 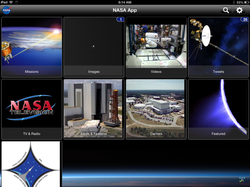 Images used on this page are screen captures from the respective app.